Charles “Chuck” Norris purchased the team in April of 2017. The former US Army Paratrooper spent over 20 years in Fayetteville and is a Veteran of Operation Desert Shield/Storm. Since 1998, Chuck has owned and operated Norris Construction, specializing in residential building and development, as well as insurance reconstruction. Prior to construction, Norris owned and operated several retail stores. Chuck lives in Charlotte with his wife, Lanai and their three children, Chucky, Lilly, and Khloe. The 2019-2020 season is Lanai’s third with the Marksmen. As the Controller/ Director of Finance, Lanai oversees the financial aspects of the team-including budget items, revenue, and payments. Lanai lives in Charlotte with Chuck and their three kids, Chucky, Lilly, and Khloe. 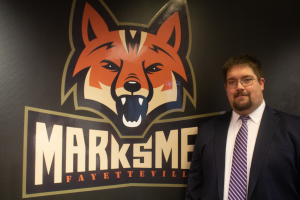 The 2019-2020 season is Daniel Chizmar’s second as the Vice President / Director of Sales for the Fayetteville Marksmen. 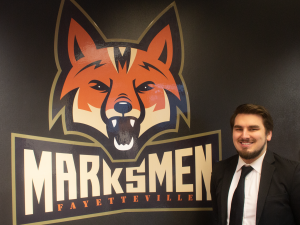 Chizmar comes to Fayetteville after spending time in the American Hockey League for the last seven seasons, working for the Providence Bruins (2012-2018) and Binghamton Devils (2018), most recently as the Vice President of Sales. Following his graduation from Johnson & Wales University with a Bachelor’s Degree in Sports Entertainment and Event Management, Chizmar worked his way up the ladder in Providence from Director of Sales, up to Vice President – Tickets & Events. Chizmar, who has always wanted to live in North Carolina, lives with his wife Monet, and their dog and cat. 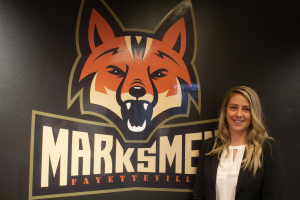 The 2019-2020 season will be Marissa Reighard’s third year with the Marksmen, first as Director of Corporate Partnerships. Prior to joining the Marksmen, Marissa worked with the world famous Toledo Mud Hens and Toledo Walleye (ECHL). While she was there she gained experience in promotions, ticket sales, and merchandise. Marissa was born in Toledo, Ohio, but has traveled and worked in various places such as, Australia, Las Vegas (Wranglers, ECHL), Vietnam, Singapore, Hong Kong, and Columbus. She earned her bachelors degree in Sport Administration with a minor in business at the University of Cincinnati. Reighard likes to play catch with her dog Dobby, participates in Crossfit, enjoys camping, and loves to spend time with family and friends. The 2019-2020 Season will be Shawn Bednard’s second as the “Voice of the Marksmen”. A 2018 graduate of Central Michigan University with a Bachelors in Broadcast and Cinematic Arts, the 22 year old brings over seven years of on-air experience with him to the team, including calling nearly 200 hockey games as the Director of Broadcasting of the Chippewa Hockey Network at CMU. 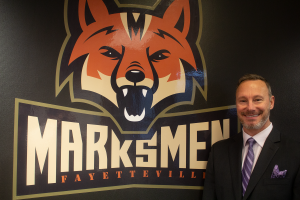 Bednard oversees all marketing and media for the Fayetteville Marksmen, as well as assist in corporate partnerships and sales.